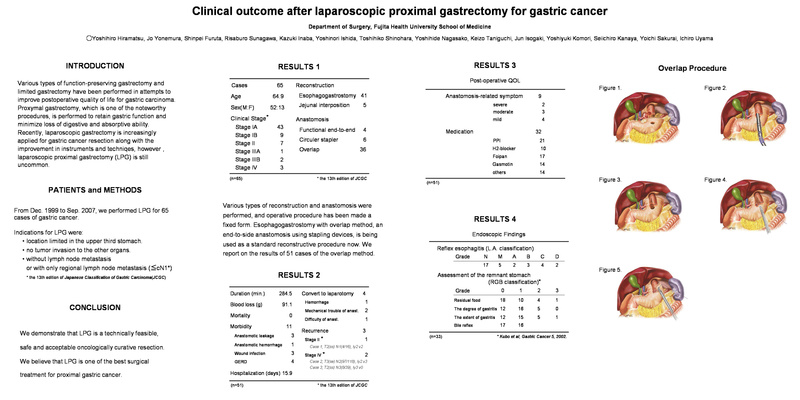 Clinical outcome after laparoscopic proximal gastrectomy for gastric cancer. INTRODUCTION; Various types of function-preserving gastrectomy and limited gastrectomy have been performed in attempts to improve postoperative quality of life for gastric carcinoma. Proximal gastrectomy, which is one of the noteworthy procedures, is performed to retain gastric function and minimize loss of digestive and absorptive ability. Recently, laparoscopic gastrectomy is increasingly applied for gastric cancer resection along with the improvement in instruments and techniqes, however, laparoscopic proximal gastrectomy (LPG) is still uncommon. PATIENTS and METHODS; From December 1999 to September 2007, we performed LPG for 63 cases of gastric cancer. Among patients with gastric cancer, indications for LPG followed in this study were: location limited in the upper third stomach, no tumor invasion to the other organs, and no evidence of lymph node (LN) metastasis as follows: the LN along the right gastroepiploic vessels (LN no. 4d), the suprapyloric LNs (LN no. 5), the infrapyloric LNs (LN no. 6), and LN in the hepatoduodenal ligament (along the hepatic artery; LN no. 12a). LN stations were defined according to the 13th edition of Japanese Classification of Gastric Carcinoma (JCGC). RESULTS; We report the technical aspects and clinical outcomes. Forty nine patients were men and 14 were women. In 63 patients, 4 cases were converted to laparotomy. Operative mortality was 0%, and morbidity was 15.9%, including 4 cases (6.3%) suffered from anastomotic leak in the initial period. Only 2 patients (3.3%) had recurrence of the gastric cancer, in 61 cases with the exception of 2 cases in clinical stage IV (JCGC). CONCLUSION; We demonstrate that LPG is a technically feasible, safe, and acceptable oncologically curative resection. We believe that LPG is one of the best surgical treatment for proximal gastric cancer.